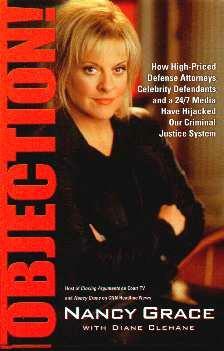 We've come to know Nancy Grace on television where we bear witness to her forthright questions, answers, and opinions. She says, "I had the opportunity to be the voice of those who have no voice, most often women, children and minorities, overlooked and never heard in our system," in Atlanta, Georgia where she grew up. This was after a personal tragedy and her subsequently going to law school. Since 1997 she's been in New York and involved with Court TV and CNN and her outspokenness is a welcome change. She has no time for defense lawyers and is strongly for a change in law where defendants' lawyers cannot keep delaying proceedings as they so often do. I enjoy her on television and when you watch her (or read this book), you know you're dealing with a woman of substance, one who has the courage of her convictions. Ms. Grace talks about the reprehensible defense lawyers and their "tactics", and in particular, refers to Johnnie Cochran (O.J. Simpson), Mark Geragos (Scott Petersen and Michael Jackson) among others. She's eloquent, honest and open and doesn't hold back for anyone. Bravo. Old court cases are discussed and she tells it like it is so that we may in the future, see through stupid and childish actions made by grown (and "educated") men in our courthouses. Women too. Many "celebrity" cases are also discussed such Michael Jackson's, Martha Stewart's, Kobe Bryant's, and Robert Blake's to name a few, as well as jurors who are in it for the money. Justice isn't what it used to be and this angers Nancy Grace, as it should! You've got my vote. The rather horrific and alarming news I learned was that people are profiting from notorious murders - websites where you can buy "murderabilia" and games and serial killer action figures. Has the world gone completely insane, I have to ask? "One of the reasons I am writing this book is to propose remedies for the existing problems in our justice system," says Ms. Grace. A portion of the proceeds of this book will go to the National Center for Missing and Exploited Children. Conclusion - Reading this book will throw a whole new light on the "system". Highly recommended.